Liczba stron: 1040 Jest to ujednolicona liczba stron, która ułatwi Ci porównanie długości książek. Każda strona Legimi to 200 słów. 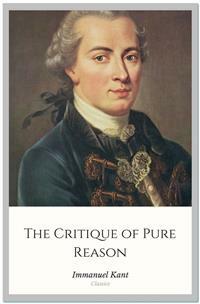 The Critique of Pure Reason is one of the seminal texts of Western philosophy, and the first of Kant's three Critiques. In it he takes up Hume's argument that cause and effect cannot be experienced by the senses. Hume argued that we experience events one after the other, but not that one event is caused by the preceding event. Kant argues that synthetic, rather than analytic thinking is needed, and addresses the problem of thinking synthetically without relying on the empirical method. It falls into this difficulty without any fault of its own. It begins with principles, which cannot be dispensed with in the field of experience, and the truth and sufficiency of which are, at the same time, insured by experience. With these principles it rises, in obedience to the laws of its own nature, to ever higher and more remote conditions. But it quickly discovers that, in this way, its labours must remain ever incomplete, because new questions never cease to present themselves; and thus it finds itself compelled to have recourse to principles which transcend the region of experience, while they are regarded by common sense without distrust. It thus falls into confusion and contradictions, from which it conjectures the presence of latent errors, which, however, it is unable to discover, because the principles it employs, transcending the limits of experience, cannot be tested by that criterion. The arena of these endless contests is called Metaphysic. At first, her government, under the administration of the dogmatists, was an absolute despotism. But, as the legislative continued to show traces of the ancient barbaric rule, her empire gradually broke up, and intestine wars introduced the reign of anarchy; while the sceptics, like nomadic tribes, who hate a permanent habitation and settled mode of living, attacked from time to time those who had organized themselves into civil communities. But their number was, very happily, small; and thus they could not entirely put a stop to the exertions of those who persisted in raising new edifices, although on no settled or uniform plan. In recent times the hope dawned upon us of seeing those disputes settled, and the legitimacy of her claims established by a kind of physiology of the human understanding—that of the celebrated Locke. But it was found that—although it was affirmed that this so-called queen could not refer her descent to any higher source than that of common experience, a circumstance which necessarily brought suspicion on her claims—as this genealogy was incorrect, she persisted in the advancement of her claims to sovereignty. Thus metaphysics necessarily fell back into the antiquated and rotten constitution of dogmatism, and again became obnoxious to the contempt from which efforts had been made to save it. At present, as all methods, according to the general persuasion, have been tried in vain, there reigns nought but weariness and complete indifferentism—the mother of chaos and night in the scientific world, but at the same time the source of, or at least the prelude to, the re-creation and reinstallation of a science, when it has fallen into confusion, obscurity, and disuse from ill directed effort. For it is in reality vain to profess indifference in regard to such inquiries, the object of which cannot be indifferent to humanity. Besides, these pretended indifferentists, however much they may try to disguise themselves by the assumption of a popular style and by changes on the language of the schools, unavoidably fall into metaphysical declarations and propositions, which they profess to regard with so much contempt. At the same time, this indifference, which has arisen in the world of science, and which relates to that kind of knowledge which we should wish to see destroyed the last, is a phenomenon that well deserves our attention and reflection. It is plainly not the effect of the levity, but of the matured judgement* of the age, which refuses to be any longer entertained with illusory knowledge, It is, in fact, a call to reason, again to undertake the most laborious of all tasks—that of self-examination, and to establish a tribunal, which may secure it in its well-grounded claims, while it pronounces against all baseless assumptions and pretensions, not in an arbitrary manner, but according to its own eternal and unchangeable laws. This tribunal is nothing less than the critical investigation of pure reason. I do not mean by this a criticism of books and systems, but a critical inquiry into the faculty of reason, with reference to the cognitions to which it strives to attain without the aid of experience; in other words, the solution of the question regarding the possibility or impossibility of metaphysics, and the determination of the origin, as well as of the extent and limits of this science. All this must be done on the basis of principles. This path—the only one now remaining—has been entered upon by me; and I flatter myself that I have, in this way, discovered the cause of—and consequently the mode of removing—all the errors which have hitherto set reason at variance with itself, in the sphere of non-empirical thought. I have not returned an evasive answer to the questions of reason, by alleging the inability and limitation of the faculties of the mind; I have, on the contrary, examined them completely in the light of principles, and, after having discovered the cause of the doubts and contradictions into which reason fell, have solved them to its perfect satisfaction. It is true, these questions have not been solved as dogmatism, in its vain fancies and desires, had expected; for it can only be satisfied by the exercise of magical arts, and of these I have no knowledge. But neither do these come within the compass of our mental powers; and it was the duty of philosophy to destroy the illusions which had their origin in misconceptions, whatever darling hopes and valued expectations may be ruined by its explanations. My chief aim in this work has been thoroughness; and I make bold to say that there is not a single metaphysical problem that does not find its solution, or at least the key to its solution, here. Pure reason is a perfect unity; and therefore, if the principle presented by it prove to be insufficient for the solution of even a single one of those questions to which the very nature of reason gives birth, we must reject it, as we could not be perfectly certain of its sufficiency in the case of the others. While I say this, I think I see upon the countenance of the reader signs of dissatisfaction mingled with contempt, when he hears declarations which sound so boastful and extravagant; and yet they are beyond comparison more moderate than those advanced by the commonest author of the commonest philosophical programme, in which the dogmatist professes to demonstrate the simple nature of the soul, or the necessity of a primal being. Such a dogmatist promises to extend human knowledge beyond the limits of possible experience; while I humbly confess that this is completely beyond my power. Instead of any such attempt, I confine myself to the examination of reason alone and its pure thought; and I do not need to seek far for the sum-total of its cognition, because it has its seat in my own mind. Besides, common logic presents me with a complete and systematic catalogue of all the simple operations of reason; and it is my task to answer the question how far reason can go, without the material presented and the aid furnished by experience. So much for the completeness and thoroughness necessary in the execution of the present task. The aims set before us are not arbitrarily proposed, but are imposed upon us by the nature of cognition itself. The above remarks relate to the matter of our critical inquiry. As regards the form, there are two indispensable conditions, which any one who undertakes so difficult a task as that of a critique of pure reason, is bound to fulfil. These conditions are certitude and clearness. As regards certitude, I have fully convinced myself that, in this sphere of thought, opinion is perfectly inadmissible, and that everything which bears the least semblance of an hypothesis must be excluded, as of no value in such discussions. For it is a necessary condition of every cognition that is to be established upon a priori grounds that it shall be held to be absolutely necessary; much more is this the case with an attempt to determine all pure a priori cognition, and to furnish the standard—and consequently an example—of all apodeictic (philosophical) certitude. Whether I have succeeded in what I professed to do, it is for the reader to determine; it is the author's business merely to adduce grounds and reasons, without determining what influence these ought to have on the mind of his judges. But, lest anything he may have said may become the innocent cause of doubt in their minds, or tend to weaken the effect which his arguments might otherwise produce—he may be allowed to point out those passages which may occasion mistrust or difficulty, although these do not concern the main purpose of the present work. He does this solely with the view of removing from the mind of the reader any doubts which might affect his judgement of the work as a whole, and in regard to its ultimate aim. I know no investigations more necessary for a full insight into the nature of the faculty which we call understanding, and at the same time for the determination of the rules and limits of its use, than those undertaken in the second chapter of the "Transcendental Analytic," under the title of "Deduction of the Pure Conceptions of the Understanding"; and they have also cost me by far the greatest labour—labour which, I hope, will not remain uncompensated. The view there taken, which goes somewhat deeply into the subject, has two sides, The one relates to the objects of the pure understanding, and is intended to demonstrate and to render comprehensible the objective validity of its a priori conceptions; and it forms for this reason an essential part of the Critique. The other considers the pure understanding itself, its possibility and its powers of cognition—that is, from a subjective point of view; and, although this exposition is of great importance, it does not belong essentially to the main purpose of the work, because the grand question is what and how much can reason and understanding, apart from experience, cognize, and not, how is the faculty of thought itself possible? As the latter is an inquiry into the cause of a given effect, and has thus in it some semblance of an hypothesis (although, as I shall show on another occasion, this is really not the fact), it would seem that, in the present instance, I had allowed myself to enounce a mere opinion, and that the reader must therefore be at liberty to hold a different opinion. But I beg to remind him that, if my subjective deduction does not produce in his mind the conviction of its certitude at which I aimed, the objective deduction, with which alone the present work is properly concerned, is in every respect satisfactory. As regards clearness, the reader has a right to demand, in the first place, discursive or logical clearness, that is, on the basis of conceptions, and, secondly, intuitive or aesthetic clearness, by means of intuitions, that is, by examples or other modes of illustration in concreto. I have done what I could for the first kind of intelligibility. This was essential to my purpose; and it thus became the accidental cause of my inability to do complete justice to the second requirement. I have been almost always at a loss, during the progress of this work, how to settle this question. Examples and illustrations always appeared to me necessary, and, in the first sketch of the Critique, naturally fell into their proper places. But I very soon became aware of the magnitude of my task, and the numerous problems with which I should be engaged; and, as I perceived that this critical investigation would, even if delivered in the driest scholastic manner, be far from being brief, I found it unadvisable to enlarge it still more with examples and explanations, which are necessary only from a popular point of view. I was induced to take this course from the consideration also that the present work is not intended for popular use, that those devoted to science do not require such helps, although they are always acceptable, and that they would have materially interfered with my present purpose. Abbe Terrasson remarks with great justice that, if we estimate the size of a work, not from the number of its pages, but from the time which we require to make ourselves master of it, it may be said of many a book that it would be much shorter, if it were not so short. On the other hand, as regards the comprehensibility of a system of speculative cognition, connected under a single principle, we may say with equal justice: many a book would have been much clearer, if it had not been intended to be so very clear. For explanations and examples, and other helps to intelligibility, aid us in the comprehension of parts, but they distract the attention, dissipate the mental power of the reader, and stand in the way of his forming a clear conception of the whole; as he cannot attain soon enough to a survey of the system, and the colouring and embellishments bestowed upon it prevent his observing its articulation or organization—which is the most important consideration with him, when he comes to judge of its unity and stability. The reader must naturally have a strong inducement to co-operate with the present author, if he has formed the intention of erecting a complete and solid edifice of metaphysical science, according to the plan now laid before him. Metaphysics, as here represented, is the only science which admits of completion—and with little labour, if it is united, in a short time; so that nothing will be left to future generations except the task of illustrating and applying it didactically. For this science is nothing more than the inventory of all that is given us by pure reason, systematically arranged. Nothing can escape our notice; for what reason produces from itself cannot lie concealed, but must be brought to the light by reason itself, so soon as we have discovered the common principle of the ideas we seek. The perfect unity of this kind of cognitions, which are based upon pure conceptions, and uninfluenced by any empirical element, or any peculiar intuition leading to determinate experience, renders this completeness not only practicable, but also necessary. Tecum habita, et noris quam sit tibi curta supellex. Such a system of pure speculative reason I hope to be able to publish under the title of Metaphysic of Nature*. The content of this work (which will not be half so long) will be very much richer than that of the present Critique, which has to discover the sources of this cognition and expose the conditions of its possibility, and at the same time to clear and level a fit foundation for the scientific edifice. In the present work, I look for the patient hearing and the impartiality of a judge; in the other, for the good-will and assistance of a co-labourer. For, however complete the list of principles for this system may be in the Critique, the correctness of the system requires that no deduced conceptions should be absent. These cannot be presented a priori, but must be gradually discovered; and, while the synthesis of conceptions has been fully exhausted in the Critique, it is necessary that, in the proposed work, the same should be the case with their analysis. But this will be rather an amusement than a labour. Whether the treatment of that portion of our knowledge which lies within the province of pure reason advances with that undeviating certainty which characterizes the progress of science, we shall be at no loss to determine. If we find those who are engaged in metaphysical pursuits, unable to come to an understanding as to the method which they ought to follow; if we find them, after the most elaborate preparations, invariably brought to a stand before the goal is reached, and compelled to retrace their steps and strike into fresh paths, we may then feel quite sure that they are far from having attained to the certainty of scientific progress and may rather be said to be merely groping about in the dark. In these circumstances we shall render an important service to reason if we succeed in simply indicating the path along which it must travel, in order to arrive at any results—even if it should be found necessary to abandon many of those aims which, without reflection, have been proposed for its attainment. That logic has advanced in this sure course, even from the earliest times, is apparent from the fact that, since Aristotle, it has been unable to advance a step and, thus, to all appearance has reached its completion. For, if some of the moderns have thought to enlarge its domain by introducing psychological discussions on the mental faculties, such as imagination and wit, metaphysical, discussions on the origin of knowledge and the different kinds of certitude, according to the difference of the objects (idealism, scepticism, and so on), or anthropological discussions on prejudices, their causes and remedies: this attempt, on the part of these authors, only shows their ignorance of the peculiar nature of logical science. We do not enlarge but disfigure the sciences when we lose sight of their respective limits and allow them to run into one another. Now logic is enclosed within limits which admit of perfectly clear definition; it is a science which has for its object nothing but the exposition and proof of the formal laws of all thought, whether it be a priori or empirical, whatever be its origin or its object, and whatever the difficulties—natural or accidental—which it encounters in the human mind. The early success of logic must be attributed exclusively to the narrowness of its field, in which abstraction may, or rather must, be made of all the objects of cognition with their characteristic distinctions, and in which the understanding has only to deal with itself and with its own forms. It is, obviously, a much more difficult task for reason to strike into the sure path of science, where it has to deal not simply with itself, but with objects external to itself. Hence, logic is properly only a propaedeutic—forms, as it were, the vestibule of the sciences; and while it is necessary to enable us to form a correct judgement with regard to the various branches of knowledge, still the acquisition of real, substantive knowledge is to be sought only in the sciences properly so called, that is, in the objective sciences. Now these sciences, if they can be termed rational at all, must contain elements of a priori cognition, and this cognition may stand in a twofold relation to its object. Either it may have to determine the conception of the object—which must be supplied extraneously, or it may have to establish its reality. The former is theoretical, the latter practical, rational cognition. In both, the pure or a priori element must be treated first, and must be carefully distinguished from that which is supplied from other sources. Any other method can only lead to irremediable confusion. Mathematics and physics are the two theoretical sciences which have to determine their objects a priori. The former is purely a priori, the latter is partially so, but is also dependent on other sources of cognition. In the earliest times of which history affords us any record, mathematics had already entered on the sure course of science, among that wonderful nation, the Greeks. Still it is not to be supposed that it was as easy for this science to strike into, or rather to construct for itself, that royal road, as it was for logic, in which reason has only to deal with itself. On the contrary, I believe that it must have remained long—chiefly among the Egyptians—in the stage of blind groping after its true aims and destination, and that it was revolutionized by the happy idea of one man, who struck out and determined for all time the path which this science must follow, and which admits of an indefinite advancement. The history of this intellectual revolution—much more important in its results than the discovery of the passage round the celebrated Cape of Good Hope—and of its author, has not been preserved. But Diogenes Laertius, in naming the supposed discoverer of some of the simplest elements of geometrical demonstration—elements which, according to the ordinary opinion, do not even require to be proved—makes it apparent that the change introduced by the first indication of this new path, must have seemed of the utmost importance to the mathematicians of that age, and it has thus been secured against the chance of oblivion. A new light must have flashed on the mind of the first man (Thales, or whatever may have been his name) who demonstrated the properties of the isosceles triangle. For he found that it was not sufficient to meditate on the figure, as it lay before his eyes, or the conception of it, as it existed in his mind, and thus endeavour to get at the knowledge of its properties, but that it was necessary to produce these properties, as it were, by a positive a priori construction; and that, in order to arrive with certainty at a priori cognition, he must not attribute to the object any other properties than those which necessarily followed from that which he had himself, in accordance with his conception, placed in the object. A much longer period elapsed before physics entered on the highway of science. For it is only about a century and a half since the wise Bacon gave a new direction to physical studies, or rather—as others were already on the right track—imparted fresh vigour to the pursuit of this new direction. Here, too, as in the case of mathematics, we find evidence of a rapid intellectual revolution. In the remarks which follow I shall confine myself to the empirical side of natural science. When Galilei experimented with balls of a definite weight on the inclined plane, when Torricelli caused the air to sustain a weight which he had calculated beforehand to be equal to that of a definite column of water, or when Stahl, at a later period, converted metals into lime, and reconverted lime into metal, by the addition and subtraction of certain elements; [Footnote: I do not here follow with exactness the history of the experimental method, of which, indeed, the first steps are involved in some obscurity.] a light broke upon all natural philosophers. They learned that reason only perceives that which it produces after its own design; that it must not be content to follow, as it were, in the leading-strings of nature, but must proceed in advance with principles of judgement according to unvarying laws, and compel nature to reply its questions. For accidental observations, made according to no preconceived plan, cannot be united under a necessary law. But it is this that reason seeks for and requires. It is only the principles of reason which can give to concordant phenomena the validity of laws, and it is only when experiment is directed by these rational principles that it can have any real utility. Reason must approach nature with the view, indeed, of receiving information from it, not, however, in the character of a pupil, who listens to all that his master chooses to tell him, but in that of a judge, who compels the witnesses to reply to those questions which he himself thinks fit to propose. To this single idea must the revolution be ascribed, by which, after groping in the dark for so many centuries, natural science was at length conducted into the path of certain progress. We come now to metaphysics, a purely speculative science, which occupies a completely isolated position and is entirely independent of the teachings of experience. It deals with mere conceptions—not, like mathematics, with conceptions applied to intuition—and in it, reason is the pupil of itself alone. It is the oldest of the sciences, and would still survive, even if all the rest were swallowed up in the abyss of an all-destroying barbarism. But it has not yet had the good fortune to attain to the sure scientific method. This will be apparent; if we apply the tests which we proposed at the outset. We find that reason perpetually comes to a stand, when it attempts to gain a priori the perception even of those laws which the most common experience confirms. We find it compelled to retrace its steps in innumerable instances, and to abandon the path on which it had entered, because this does not lead to the desired result. We find, too, that those who are engaged in metaphysical pursuits are far from being able to agree among themselves, but that, on the contrary, this science appears to furnish an arena specially adapted for the display of skill or the exercise of strength in mock-contests—a field in which no combatant ever yet succeeded in gaining an inch of ground, in which, at least, no victory was ever yet crowned with permanent possession. This leads us to inquire why it is that, in metaphysics, the sure path of science has not hitherto been found. Shall we suppose that it is impossible to discover it? Why then should nature have visited our reason with restless aspirations after it, as if it were one of our weightiest concerns? Nay, more, how little cause should we have to place confidence in our reason, if it abandons us in a matter about which, most of all, we desire to know the truth—and not only so, but even allures us to the pursuit of vain phantoms, only to betray us in the end? Or, if the path has only hitherto been missed, what indications do we possess to guide us in a renewed investigation, and to enable us to hope for greater success than has fallen to the lot of our predecessors? Nil actum reputans, si quid superesset agendum. But, it will be asked, what kind of a treasure is this that we propose to bequeath to posterity? What is the real value of this system of metaphysics, purified by criticism, and thereby reduced to a permanent condition? A cursory view of the present work will lead to the supposition that its use is merely negative, that it only serves to warn us against venturing, with speculative reason, beyond the limits of experience. This is, in fact, its primary use. But this, at once, assumes a positive value, when we observe that the principles with which speculative reason endeavours to transcend its limits lead inevitably, not to the extension, but to the contraction of the use of reason, inasmuch as they threaten to extend the limits of sensibility, which is their proper sphere, over the entire realm of thought and, thus, to supplant the pure (practical) use of reason. So far, then, as this criticism is occupied in confining speculative reason within its proper bounds, it is only negative; but, inasmuch as it thereby, at the same time, removes an obstacle which impedes and even threatens to destroy the use of practical reason, it possesses a positive and very important value. In order to admit this, we have only to be convinced that there is an absolutely necessary use of pure reason—the moral use—in which it inevitably transcends the limits of sensibility, without the aid of speculation, requiring only to be insured against the effects of a speculation which would involve it in contradiction with itself. To deny the positive advantage of the service which this criticism renders us would be as absurd as to maintain that the system of police is productive of no positive benefit, since its main business is to prevent the violence which citizen has to apprehend from citizen, that so each may pursue his vocation in peace and security. That space and time are only forms of sensible intuition, and hence are only conditions of the existence of things as phenomena; that, moreover, we have no conceptions of the understanding, and, consequently, no elements for the cognition of things, except in so far as a corresponding intuition can be given to these conceptions; that, accordingly, we can have no cognition of an object, as a thing in itself, but only as an object of sensible intuition, that is, as phenomenon—all this is proved in the analytical part of the Critique; and from this the limitation of all possible speculative cognition to the mere objects of experience, follows as a necessary result. At the same time, it must be carefully borne in mind that, while we surrender the power of cognizing, we still reserve the power of thinking objects, as things in themselves. * For, otherwise, we should require to affirm the existence of an appearance, without something that appears—which would be absurd. Now let us suppose, for a moment, that we had not undertaken this criticism and, accordingly, had not drawn the necessary distinction between things as objects of experience and things as they are in themselves. The principle of causality, and, by consequence, the mechanism of nature as determined by causality, would then have absolute validity in relation to all things as efficient causes. I should then be unable to assert, with regard to one and the same being, e.g., the human soul, that its will is free, and yet, at the same time, subject to natural necessity, that is, not free, without falling into a palpable contradiction, for in both propositions I should take the soul in the same signification, as a thing in general, as a thing in itself—as, without previous criticism, I could not but take it. Suppose now, on the other hand, that we have undertaken this criticism, and have learnt that an object may be taken in two senses, first, as a phenomenon, secondly, as a thing in itself; and that, according to the deduction of the conceptions of the understanding, the principle of causality has reference only to things in the first sense. We then see how it does not involve any contradiction to assert, on the one hand, that the will, in the phenomenal sphere—in visible action—is necessarily obedient to the law of nature, and, in so far, not free; and, on the other hand, that, as belonging to a thing in itself, it is not subject to that law, and, accordingly, is free. Now, it is true that I cannot, by means of speculative reason, and still less by empirical observation, cognize my soul as a thing in itself and consequently, cannot cognize liberty as the property of a being to which I ascribe effects in the world of sense. For, to do so, I must cognize this being as existing, and yet not in time, which—since I cannot support my conception by any intuition—is impossible. At the same time, while I cannot cognize, I can quite well think freedom, that is to say, my representation of it involves at least no contradiction, if we bear in mind the critical distinction of the two modes of representation (the sensible and the intellectual) and the consequent limitation of the conceptions of the pure understanding and of the principles which flow from them. Suppose now that morality necessarily presupposed liberty, in the strictest sense, as a property of our will; suppose that reason contained certain practical, original principles a priori, which were absolutely impossible without this presupposition; and suppose, at the same time, that speculative reason had proved that liberty was incapable of being thought at all. It would then follow that the moral presupposition must give way to the speculative affirmation, the opposite of which involves an obvious contradiction, and that liberty and, with it, morality must yield to the mechanism of nature; for the negation of morality involves no contradiction, except on the presupposition of liberty. Now morality does not require the speculative cognition of liberty; it is enough that I can think it, that its conception involves no contradiction, that it does not interfere with the mechanism of nature. But even this requirement we could not satisfy, if we had not learnt the twofold sense in which things may be taken; and it is only in this way that the doctrine of morality and the doctrine of nature are confined within their proper limits. For this result, then, we are indebted to a criticism which warns us of our unavoidable ignorance with regard to things in themselves, and establishes the necessary limitation of our theoretical cognition to mere phenomena. The positive value of the critical principles of pure reason in relation to the conception of God and of the simple nature of the soul, admits of a similar exemplification; but on this point I shall not dwell. I cannot even make the assumption—as the practical interests of morality require—of God, freedom, and immortality, if I do not deprive speculative reason of its pretensions to transcendent insight. For to arrive at these, it must make use of principles which, in fact, extend only to the objects of possible experience, and which cannot be applied to objects beyond this sphere without converting them into phenomena, and thus rendering the practical extension of pure reason impossible. I must, therefore, abolish knowledge, to make room for belief. The dogmatism of metaphysics, that is, the presumption that it is possible to advance in metaphysics without previous criticism, is the true source of the unbelief (always dogmatic) which militates against morality. Thus, while it may be no very difficult task to bequeath a legacy to posterity, in the shape of a system of metaphysics constructed in accordance with the Critique of Pure Reason, still the value of such a bequest is not to be depreciated. It will render an important service to reason, by substituting the certainty of scientific method for that random groping after results without the guidance of principles, which has hitherto characterized the pursuit of metaphysical studies. It will render an important service to the inquiring mind of youth, by leading the student to apply his powers to the cultivation of genuine science, instead of wasting them, as at present, on speculations which can never lead to any result, or on the idle attempt to invent new ideas and opinions. But, above all, it will confer an inestimable benefit on morality and religion, by showing that all the objections urged against them may be silenced for ever by the Socratic method, that is to say, by proving the ignorance of the objector. For, as the world has never been, and, no doubt, never will be without a system of metaphysics of one kind or another, it is the highest and weightiest concern of philosophy to render it powerless for harm, by closing up the sources of error. This important change in the field of the sciences, this loss of its fancied possessions, to which speculative reason must submit, does not prove in any way detrimental to the general interests of humanity. The advantages which the world has derived from the teachings of pure reason are not at all impaired. The loss falls, in its whole extent, on the monopoly of the schools, but does not in the slightest degree touch the interests of mankind. I appeal to the most obstinate dogmatist, whether the proof of the continued existence of the soul after death, derived from the simplicity of its substance; of the freedom of the will in opposition to the general mechanism of nature, drawn from the subtle but impotent distinction of subjective and objective practical necessity; or of the existence of God, deduced from the conception of an ens realissimum—the contingency of the changeable, and the necessity of a prime mover, has ever been able to pass beyond the limits of the schools, to penetrate the public mind, or to exercise the slightest influence on its convictions. It must be admitted that this has not been the case and that, owing to the unfitness of the common understanding for such subtle speculations, it can never be expected to take place. On the contrary, it is plain that the hope of a future life arises from the feeling, which exists in the breast of every man, that the temporal is inadequate to meet and satisfy the demands of his nature. In like manner, it cannot be doubted that the clear exhibition of duties in opposition to all the claims of inclination, gives rise to the consciousness of freedom, and that the glorious order, beauty, and providential care, everywhere displayed in nature, give rise to the belief in a wise and great Author of the Universe. Such is the genesis of these general convictions of mankind, so far as they depend on rational grounds; and this public property not only remains undisturbed, but is even raised to greater importance, by the doctrine that the schools have no right to arrogate to themselves a more profound insight into a matter of general human concernment than that to which the great mass of men, ever held by us in the highest estimation, can without difficulty attain, and that the schools should, therefore, confine themselves to the elaboration of these universally comprehensible and, from a moral point of view, amply satisfactory proofs. The change, therefore, affects only the arrogant pretensions of the schools, which would gladly retain, in their own exclusive possession, the key to the truths which they impart to the public. Quod mecum nescit, solus vult scire videri. At the same time it does not deprive the speculative philosopher of his just title to be the sole depositor of a science which benefits the public without its knowledge—I mean, the Critique of Pure Reason. This can never become popular and, indeed, has no occasion to be so; for finespun arguments in favour of useful truths make just as little impression on the public mind as the equally subtle objections brought against these truths. On the other hand, since both inevitably force themselves on every man who rises to the height of speculation, it becomes the manifest duty of the schools to enter upon a thorough investigation of the rights of speculative reason and, thus, to prevent the scandal which metaphysical controversies are sure, sooner or later, to cause even to the masses. It is only by criticism that metaphysicians (and, as such, theologians too) can be saved from these controversies and from the consequent perversion of their doctrines. Criticism alone can strike a blow at the root of materialism, fatalism, atheism, free-thinking, fanaticism, and superstition, which are universally injurious—as well as of idealism and scepticism, which are dangerous to the schools, but can scarcely pass over to the public. If governments think proper to interfere with the affairs of the learned, it would be more consistent with a wise regard for the interests of science, as well as for those of society, to favour a criticism of this kind, by which alone the labours of reason can be established on a firm basis, than to support the ridiculous despotism of the schools, which raise a loud cry of danger to the public over the destruction of cobwebs, of which the public has never taken any notice, and the loss of which, therefore, it can never feel. This critical science is not opposed to the dogmatic procedure of reason in pure cognition; for pure cognition must always be dogmatic, that is, must rest on strict demonstration from sure principles a priori—but to dogmatism, that is, to the presumption that it is possible to make any progress with a pure cognition, derived from (philosophical) conceptions, according to the principles which reason has long been in the habit of employing—without first inquiring in what way and by what right reason has come into the possession of these principles. Dogmatism is thus the dogmatic procedure of pure reason without previous criticism of its own powers, and in opposing this procedure, we must not be supposed to lend any countenance to that loquacious shallowness which arrogates to itself the name of popularity, nor yet to scepticism, which makes short work with the whole science of metaphysics. On the contrary, our criticism is the necessary preparation for a thoroughly scientific system of metaphysics which must perform its task entirely a priori, to the complete satisfaction of speculative reason, and must, therefore, be treated, not popularly, but scholastically. In carrying out the plan which the Critique prescribes, that is, in the future system of metaphysics, we must have recourse to the strict method of the celebrated Wolf, the greatest of all dogmatic philosophers. He was the first to point out the necessity of establishing fixed principles, of clearly defining our conceptions, and of subjecting our demonstrations to the most severe scrutiny, instead of rashly jumping at conclusions. The example which he set served to awaken that spirit of profound and thorough investigation which is not yet extinct in Germany. He would have been peculiarly well fitted to give a truly scientific character to metaphysical studies, had it occurred to him to prepare the field by a criticism of the organum, that is, of pure reason itself. That he failed to perceive the necessity of such a procedure must be ascribed to the dogmatic mode of thought which characterized his age, and on this point the philosophers of his time, as well as of all previous times, have nothing to reproach each other with. Those who reject at once the method of Wolf, and of the Critique of Pure Reason, can have no other aim but to shake off the fetters of science, to change labour into sport, certainty into opinion, and philosophy into philodoxy. In this second edition, I have endeavoured, as far as possible, to remove the difficulties and obscurity which, without fault of mine perhaps, have given rise to many misconceptions even among acute thinkers. In the propositions themselves, and in the demonstrations by which they are supported, as well as in the form and the entire plan of the work, I have found nothing to alter; which must be attributed partly to the long examination to which I had subjected the whole before offering it to the public and partly to the nature of the case. For pure speculative reason is an organic structure in which there is nothing isolated or independent, but every Single part is essential to all the rest; and hence, the slightest imperfection, whether defect or positive error, could not fail to betray itself in use. I venture, further, to hope, that this system will maintain the same unalterable character for the future. I am led to entertain this confidence, not by vanity, but by the evidence which the equality of the result affords, when we proceed, first, from the simplest elements up to the complete whole of pure reason and, and then, backwards from the whole to each part. We find that the attempt to make the slightest alteration, in any part, leads inevitably to contradictions, not merely in this system, but in human reason itself. At the same time, there is still much room for improvement in the exposition of the doctrines contained in this work. In the present edition, I have endeavoured to remove misapprehensions of the aesthetical part, especially with regard to the conception of time; to clear away the obscurity which has been found in the deduction of the conceptions of the understanding; to supply the supposed want of sufficient evidence in the demonstration of the principles of the pure understanding; and, lastly, to obviate the misunderstanding of the paralogisms which immediately precede the rational psychology. Beyond this point—the end of the second main division of the "Transcendental Dialectic"—I have not extended my alterations,* partly from want of time, and partly because I am not aware that any portion of the remainder has given rise to misconceptions among intelligent and impartial critics, whom I do not here mention with that praise which is their due, but who will find that their suggestions have been attended to in the work itself. follows: "But this permanent cannot be an intuition in me.